In our quest to create a CRUD application we have completed the read and the delete portion. In this article we will generate the create functionality. For now I am using the jQuery Templates in the future I will be switching to something else. First thing that needs to be done is to open up the CustomerController.cs in the web api and create a new method with the name of PostCustomer. It will return an HttpResponseMessage and will look for a parameter of Customer. To improve on the user experience I am first checking to verify if the customer currently exist. Going back to my note above, I am doing this in case a user uses the reverse logic then the customer object will be placed in the correct method. If the user does not exist we will call Entity Framework and execute SaveChanges(). We will then create our HttpResponseMessage and pass in the customer object and an HttpStatusCode.Created. This is considered good practice for one to notify the contact that something happened and the ajax call can check that the return message was a 201. jQuery’s ajax call mechanism can check for specific return messaged and conduct different actions. An example might could be if the message is 201 display a message that says “Customer ID xxxxx has been successfully created.” Since the customer object with the new ID back is being passed back, the message could display the correct ID. Included in this HttpResponseMessage the Headers.Localtion with the RequestUri that will give the address to this new user. Now to update the HTML file. In the tools div add a new button to create a new customer. Note: Edit is a little easier because we can use the object in the jQuery observable, this was the easiest way I found. JSRender/JSView might offer an easier or dynamic option. Call $.ajax with the verb of POST and then the sentData. Add a success function to the Ajax call. If no errors are returned the new customer will be added to the observable object that the data grid is bound to. and finally close the dialog. 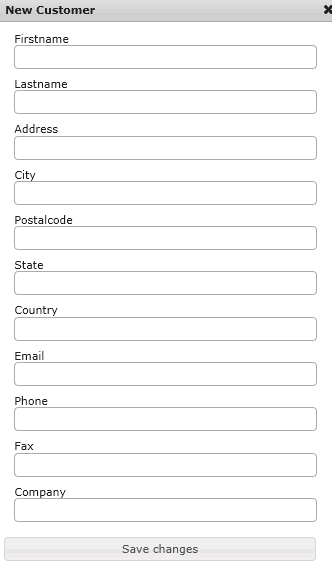 Run the code, click the New Customer button and the following form should open. Add some data and click save changes. In the Grid the new customer should show up.